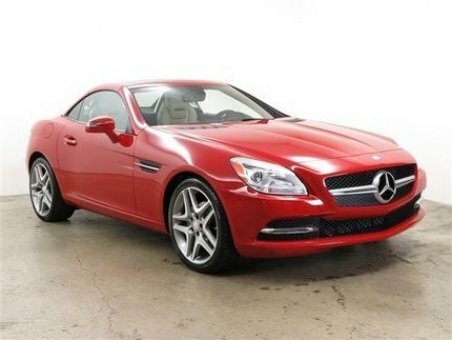 Get behind the wheel of this Car-Fax Certified pre-owned 1 owner 2014 SLK250 Roadster with very low mileage! Equipped with 18 Liter inline 4 cylinder turbocharged engine the beautiful SLK250 is painted with Mars Red paint and equipped with Sahara Beige interior! Many features are also included such as satellite radio, navigation, heated and ventilated seats, premium Harmon/Kardon sound system, Bluetooth connection and much more! Our company only sells reliable used cars that we would buy ourselves. Here at our cheap-carsforsale.com auction you won't just find cars you'll find a diversified range of rental cars for sale, you'll get the chance to sign in and start making bids. We are going to shatter your expectations, buying a used car was never that interesting and trusty, so forget about your previous car dealerships. At cheap-carsforsale.com you'll get the chance to experience yourself how it feels while buying a used car, finding the best cheap muscle cars, making bids, winning an auction at the cheapest prices and selling your second hand car. Our public auction is easy to access and 100% reliable, feel free to bid and take your dream cars home We don't just sell reliable used cars, we do it at the cheapest used car pricing. We strongly believe that buying collector cars for sale shouldn’t simply be a material need, but rather a choice in changing your lifestyle for the better. At Cheap Cars for Sale you can profit from exceptional savings without compromising on service or comfort while choosing a used car from our auctions. Buy used cars online at the most reasonable prices, bid with confidence and appreciate the advantages our car sale website can offer. Enjoy our well-maintained and reliable vehicles for sale and get the one just for you!